Is he the next rising teen star? A friend of mine recently sang at the infamous open mic night at BlueBird Cafe in Nashville, TN. While there, he met many musicians, wanna-bes, producers and agents. One person that struck a chord was 16-year old Casey Lee Smith who came down from Arizona to sing at the BlueBird. While my friend claimed Casey was amazing, I was skeptical being that he is 16. 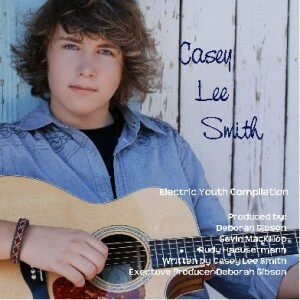 Always looking for the opportunity to review, I paid a visit to Casey’s web site, www.caseyleesmith.com. The second I clicked on his music, I was touched. In fact, it’s playing in the background as I blog and four of his songs are already on my ITunes (and I’m a discerning downloader). Heartfelt lyrics, friendly vocals, and harmonious instruments leave your toes tapping and heart smiling. Casey’s style is part country, rock, blues all fused into one unique sound. But don’t let his age fool you – he appeals to teens, adults and everyone in between! The younger crowd will appreciate his blue-eyed, curly -haired charm and the more mature audience will connect with his spot-on lyrics. My favorite song is “Losing You,” a song about a broken relationship. As Casey writes: “When you’ve screwed up your relationship, there’s nothing to do but point to where the blame belongs. Me.” “Losing You” is a ballad for anyone who’s felt that regret after a hard-to-get-over break up. Grading Girl predicts this will be number one on the charts someday soon!! “Chasin’ Tin Cans” is a fun, raucous, rock song written about, of all things, running barrels. Any woman, however, will feel empowered singing along to the lyrics “She’s moving like a rocket ship, blood surging through her vains.” A country “Barracuda” song! “Never Stood Taller” is a celebratory song about his grandfather being baptized as an adult and proclaims “He never stood taller than when he’s on his knees. He never was stronger than when his head is bowed.” Very spiritually powerful . . . and what a beautiful subject to write about. That’s what is amazing about Casey’s songs – the maturity in his lyrics shine through so that we learn something after listening. His songs help us reflect on our own experiences, misgivings, and triumphs. According to his site, Casey has been singing and playing instruments at a very early age . . . piano, banjo, guitar are among those he brings to life. He attends the Arizona Conservatory for Arts and Academics. It takes dedication, persistence, and discipline to harbor your talent from very young on. Grading Girl gives Casey Lee Smith an A for remarkable early talent and an undoubtedly bright future. Sounding this polished at age 16, I dare imagine what he will sound like in a few years. Casey Lee Smith – memorize that name. You’ll be hearing it again.